Divi Pub. A Divi Child Theme designed for pubs, bars, restaurants, cafes and more. Divi Pub has been designed with the food and beverage industry in mind. 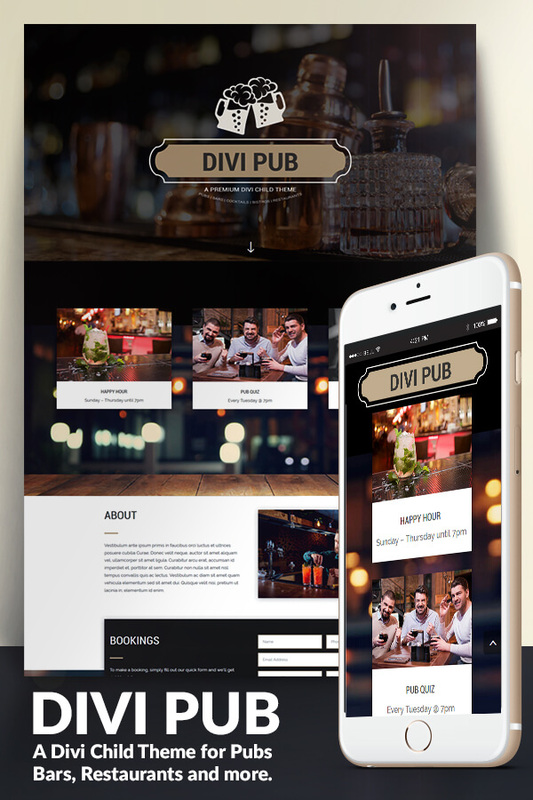 Divi Pub features an elegant one-page design to efficiently display services relevant to a pub, bar or restaurant. Sections include About, Bookings, What’s On, Blog, Contact and Reviews. Divi Pub harnesses the power of the Divi Theme by Elegant Themes, allowing for easy customisation with the powerful drop-and-drag Divi Builder and Visual Builder. All custom CSS is placed within one stylesheet to allow for easy customisations. Please Note: This child theme requires the Divi parent theme to be installed. You need an active Elegant Themes subscription for this child theme to work which is not included in the purchase price of this product. You are welcome to use this child theme for both commercial and personal use on as many sites as you like. Support is available for 6 months after purchase, but support does not include customisations of the theme on your own website. Inline|Creative is not responsible for any conflicts due to updates with WordPress, Divi or any third party plugins or extensions. A good knowledge of Divi and WordPress is recommended to get the most out of this child theme. Full documentation is included within the child theme, however a more advanced level of CSS knowledge is recommended for making advanced customisations to the child theme’s code. Inline|Creative is not liable for any coding conflicts that are caused by the end-user after installation.